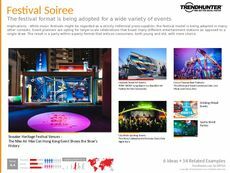 Find Better Ideas, Faster ® with a custom festival trend report, our PRO Dashboard and 80+ categories of premium trend reports. 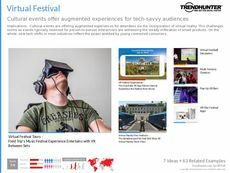 The Festival Trend Report compiles data on festivals, concerts and events surrounding music, food and culture. 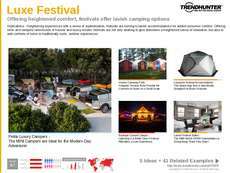 The report includes niche festivals that are formed around different themes like camping, luxury experiences and celebrity appearances. We also study foodies and music lovers, who are the main attendees of these festivals. We also include festival-inspired fashions, like fringe, floral and headwear. 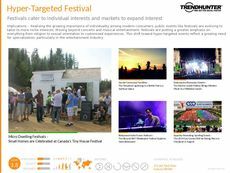 Finally, the pop-up stations involved in festivals are explored and the opportunities these bring to brands across industries. This report is curated for music venue owners, festival organizers and concert managers. It also appeals to brand professionals, marketing teams and business executives across industries like fashion, camping and alcohol to inspire co-branded collaborations and sponsorship. Food truck owners will also find this report applicable. 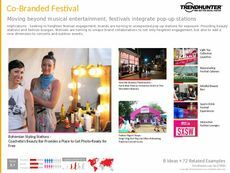 The Festival Trend Report outlines music, food and fashion festivals that are exploding in popularity with Millennials and Generation Z.